Apex Kidney Care(AKC) in association with the A M Naik charitable health care facility has initiated a 10 bedded dialysis unit at Nirali, L&T, Powai, Mumbai. 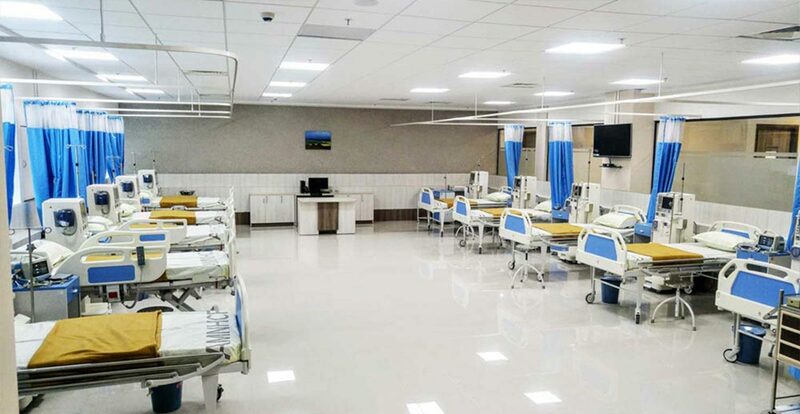 This dialysis unit (spread over more than 1000 sq feet) is primarily aimed at providing superior class dialysis facility. It is located near L and T, Powai, Mumbai and easily reachable by the Mumbai Metro. Apex Kidney Care strives tirelessly to deliver world class quality dialysis to its patients. We are proudly one of the foremost providers for quality dialysis in India with current status of more than 50 dialysis centers across 6 states including Gujarat, Goa, Haryana, Orissa, etc. AKC stands as one of the premier tertiary health care providers with a team of 5 dedicated Nephrologists and over 10 associate doctors. AKC is also one of the pioneers of Dominos transplant ( swap transplantation within 5 pairs) in the country.